In this section, I’ll post as many vintage (or what I believe to be vintage) adapters as I currently have. Trust me, I am nowhere near an expert on these things so I’m pretty much just learning as I go. If you find any discrepancies in what I post, please let me know so that I can make the necessary corrections. It will take me a while to photograph and post all the adapters, so hang in there. I’ll eventually get through this! This is the standard Recoton adapter that most everyone is familiar with. Today, you see this pattern plastered on pretty much everything. They came in various colors, although the yellow seems to be the one that was most popular. These adapters have three triangular points that grip the inside edge of the record center. There were several other companies including Fidelitone in Monticello, NY and Automatic Plastics in Canada which made their own versions of the Recoton adapter. They varied slightly in the thickness of the arms and heads but remained true to the overall design of the adapter. Below I will show the front and backs of several different variations of the adapters actually marked Recoton. Each came in many colors, although I’ll only show one adapter and color for each variation. This variation has the typical Recoton front plus Made in U.S.A. on the back. This also has drive pins. This is similar to the yellow one above, but the Made in U.S.A. is slightly different as it appears to have more of a circle around it. This adapter also has no drive pins, but more of a depression or dimple on one side. Not sure of the significance of that other than being part of the mold. This adapter has similar to the one above, but there is no circle around the Made in U.S.A. It also has the same depressions. This is the more basic Recoton adapter. It has the typical Recoton front, but the back is blank. This version has drive pins. These adapters are clearly modeled after the Recoton, but have some differences. The only stamp on these are U.S.A. There is nothing stamped on the back of these. You can also see that they have very storng drive pins. I do not know the manufacturer of these specific adapters. I’ve also seen this adapter in numerous colors including several shades of blue, yellow and red. The front of the adapter shows “45 R.P.M.” and then what appears to be the mold number. They also have “Made in the U.S.A.” on the back. The yellow adapter on the right shows the back of the adapter. I do not know the manufacturer of this adapter. This adapter is from a Canadian company called Automatic Plastics Company. The front side of the adapter shows the company name and location while the back side is stamped 45 R.P.M. Record Adapter. This adapter is nearly identical to the original Recoton although the drive pins are in a different location. I’ve seen this adapter in many colors including yellow, red, blue and gold. These Recoton style adapters are very generic in that they have no markings at all. I’m only showing one side of these since neither side as any identifiable labeling. Some of these have drive pins while others don’t. The drive pins also vary from very small to larger. These next two adapters are similar but do have some minor differences. For one, the adapter on the left is clearly marked “Vogue”. Vogue was a French record label, founded in 1947 as Disques Vogue by Léon Cabat and Charles Delaunay. In 1973 they changed their label appearance to simply Vogue. The Company initially began by releasing Jazz music but since the 50’s it has also released French pop music and licensed American and British pop music. The label was then acquired by Sony BMG Music Entertainment and subsequently Sony Music Entertainment – who own the rights to the label’s catalog. The adapter on the right is similar to the French Vogue adapter but has no markings. I’m assuming that it’s French since it’s so extremely similar to the Vogue. I’ve only seen this in white although I would not be surprised if it came on other colors as well. This is the Goldring adapter. The Goldring Company was started in 1906. In 1926 they released their first phonograph called the “Juwel Electro Soundbox”. Over the years, they have specialized in cartridges and turntables. This is an adapter from the Toshiba Corporation. Toshiba was founded in 1938 and currently offers a wide range of products and services, including air conditioners, control systems and consumer electronics and appliances. The Mercury Record Company was formed in Chicago, Illinois in 1945. They produced this adapter in various colors. 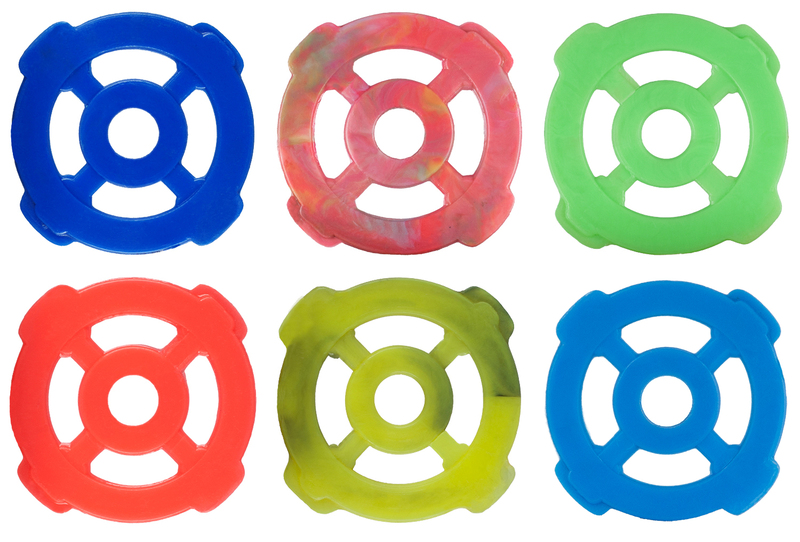 Several color variations are shown here including one with a white and blue swirl. Like the Recoton, the Mercury also worked off a triangular shape. Instead of 6 points of contact though, the Mercury had three. I have no information on this adapter other than it was found in the UK. It has no markings on it and I’ve only seen it in black. These are the popular Hutchinson adapters. The Hutchinson adapter was named after Tom Hutchison, an inventor from New Jersey. RCA asked Tom Hutchinson to design a better performing adapter. In the 1950’s, Hutchison developed this plastic adapter with drive pins which were basically small bumps on both sides of the adapter. These drive pins would interlock when stacked on each other this forcing all the records on a stack to spin at exactly the same speed with no slippage at all. The adapter looked somewhat similar to the Recoton adapter except it was a bit more bulky with extra bracing struts. There are two orientations of this adapter (when looking at the adapter with the markings on top). On one, the arm point clockwise, while on the others they point in the opposite direction. I’ll group these adapters based on their orientation. Here are the adapters in the opposite orientation. This adapter is similar to the Hutchinson adapters but seems to be “thinner” and has no markings. It’s also interesting to note that unlike most adapters, this one has only one drive pin. I think I was finally able to track the origin of these adapters. I realized that the majority of these I found were in 45’s coming from Turkey. I spoke with two different people from Turkey and they confirmed that these were manufactured in turkey sometime in the late 60’s/early 70’s. I was not able to identify a manufacturer, but at least we now know where these originated. There are a good number of variations of this adapter, but instead of trying to split them up by their slight differences, I’m just going to put them all together in on grouping. I’ve got a good number of color variations and more to come. These adapters are very similar to the ones above, but they have a different orientation. I believe that these may have also originated from Turkey so, at least for now, I’ll keep them here. This adapter is very similar to the ones above but is branded. This is what I can make out from the markings. This is definitely an Italian adpater. The word Viareggio is a city in northern Tuscany, Italy, on the coast of the Tyrrhenian Sea…thus Italian. The word dischi translates to the word disc. When it comes to the word cerri, I’m at a loss. It could be anything from a street to a persons or shops name. I’ll have to keep searching on this one. I’ve also seen this same adapter in black. I have found several variations of this adapter. I can’t confirm exactly where they were manufactured, but from what I’ve been able to uncover these are likely from the German company, Deutsche Grammophon and which started manufacturing these in the mid to late 50’s. Although these look extremely similar, their markings are different. I haven’t confirmed if these are from different manufacturers or simply different molds. The first one that I’m showing has the markings of KPL Mst½. I found three variations of this adapter. The two on the left are the same except for the fact that the center one has drive pins and the one on the left does not. The adapter on the right has the markings upside down from the other versions. The markings are the same on all three adapters. For this style adapter, the ones with the KPL markings are that I’ve seen most often. Although similar to the three above, this next adapter has different markings. This one is labeled STE 7.1 plus what appears to be a mold number. As with the ones above, this one is also similar but has the markings BECO on it. These have the markings Jugoton on them. Jugoton was the largest record label and chain record store in the former Socialist Federal Republic of Yugoslavia based in Zagreb, Socialist Republic of Croatia. Jugoton was formed in 1947. It is notable for releasing some of the most important former Yugoslav pop and rock records. In addition, the company owned a widespread network of record shops across SFR Yugoslavia. After the process of dissolution of Yugoslavia began, the company changed its name to Croatia Records in 1990. There are also versions of this adapter that had no manufacturing marks (except maybe a mold number). These came with and without drive pins. The ones with no markings appear to have come in more color variations. This first set are ones that have drive pins. These next ones are the same as the ones directly above, but have no drive pins. As you can tell, this one is unique in that it has more “chunky” contact points. This one has the same shape, but clearly has more spring-like contact points than the others. Not sure of the origin of this one but would definitely be interested in learning more about this unique adapter. This next adapter is somewhat similar to the ones above, but instead of the sides being rounded, these come to more of a point in the middle. There are no markings on this adapter and I’ve only seen it in black. These next adapters are somewhat similar to the ones above, but have a rounded center. There are two variations of this one that I’m aware of. One has no markings while the other has ΩNOTEXNIKH on the one side. These were manufactured by a small company in Greece sometime in the 60’s. The factory has since closed. This one has a slightly different twist to it. It’s an Italian adapter. The adapter is labeled “Patent Calligaro Made in Italy”. I’m not sure of the meaning of Calligaro, although my research tends to lean towards it being a name of something or someone. The flexibility of the top two points likely allowed for added flexibility when inserting the adapter with a likely tighter fit. It’s also the only one in this group with 4 contact points. This next adapters almost look more like a BMX or steering wheels than record adapters. These were manufactured by the Morse Manufacturing Company, Inc. By far the most common color for this adapter is black although they were also available in the yellow shown here as well as red. There may have been other colors, but I have not seen them. There are numerous knock offs that came in other colors. These next adapters are similar to the Morse adapter but have no manufacturer markings. The only thing that is displayed is the mold cavity number. I believe that more colors were available but these are the ones I currently have that I can photograph. It’s possible that Morse made these as well, but I can’t confirm that. This next adapter which is also similar to the Morse adapter I find very interesting. It was manufactured by Delphon. From what I’ve learned, the Delphon trade mark was bought from the original Delphon company by Quali-Fi, the Danish agent for Sansui, SAE, Radford and many other interesting mainly American select companies. I don’t know when this was manufactured, so I’m not sure where it falls ownership timeline. I do know that Delphon also manufactured turntables, some of which can be worth some money due to them being fairly rare or exotic. This is the only adapter that I’ve seen with this specific design. It’s very similar to the Morse except for the fact that there’s a notch cut out at the bottom of the adapter. It’s funny because when I received this adapter, at first glance I thought it was broken at the bottom. I can only assume that the cut out was incorporated into the adapter to make it easier to remove the adapter from a 45. I can’t believe it would add much to inserting the adapter as that is relatively easy with this style. These are the popular Philco adapters. Philco was founded in 1892 as the Helios Electric Company. One of their most interesting products was the Philco “Beam of Light” 78 RPM record player offered in 1941 and 1942. These units had a tiny mirror attached to the player’s needle. A beam of light was focused on the mirror which caused a vibrating light to hit a solar cell and produce the audio signal. While this system had some advantages over the standard crystal phono cartridge of the time, it was unreliable and is today a very difficult unit to restore. At some point while in the turntable market, they manufactured these adapters. The clear cherry ball red was the most popular and most often seen in 45’s, although as shown here, other colors were manufactured as well. This is one of the more interesting and unique adapters I’ve come across. It’s basically got a “dog bone” shape that attaches like most other adapters where opposite corners connect to the side of the record and the other two to the other. As you can see below, there are numerous variations and branding of this style of adapter. Two of these adapters have no branding at all. The green adapter is labeled Raifon Trieste. I haven’t been able to come up with anything on this particular company but I can confirm that Trieste is a town in Italy. The blue adapter is marked VAAM around the center on one side. I’ve been told by a collector (thanks Gil) that he believes that VAAM is Vannes Ambrosi, a manufacturer in Milan that made radios early on. So I guess the bottom line, for me at least, is that I find these quite interesting due to their unique design. These next two adapters come from an old Portuguese record label. The markings on them show Alvorada on one side and Fabrica Portuguesa de Discos which roughly translates to “Manufactures Portuguese Discs” on the other. From what I’ve been able to research, this was Portuguese first industrial pressing plant and was founded on 1947 by Rádio Triunfo, Lda. Company. They was also known as F.P.D. They started with the Melodia Label but changing later to the Alvorada Label. At some point during the Alvorada period, they produced these adapters. I am not aware of any showing the Melodia name. These are the only two colors that I’ve seen this adapter in. These are another adapters that I haven’t really been able to find anything on. The shape of these are similar to the Turkish adapters that are shown on this page, except these adapters have a center ring support. These two are slightly different and my be different manufacturers, but because of their similarity I’ve grouped them together. I’ve only seen these in black and in white but I would suspect that there are other colors out there as well. Until I can come up with a manufacturer, I just refer to it as the dart board adapter since it does somewhat resemble a dart board. There are no markings on either of these adapters. Every time I see these adapters, I can’t help but think to myself that someone really put a lot of effort into designing them. There’s a lot going on with this design. These are Centratore Framez adapters. I’m assuming this is an Italian adapter since Centratore Framez roughly translates to Centering Frame in Italian. This would make sense seeing that it’s a record adapter that’s used for centering a 45 record on a turntable. I don’t know enough about languages if this would translate the same in other languages, but until I come up with something different I’ll stick with my theory. This is another rather unique looking adapter. I’ve only seen this particular style in black although there are two variations. The drive pin styles are different. On one the drive pins are round while on the other they’re more oval. I have not been able to identify any manufacturer information, nor are there any markings on this adapter to give any indication where it’s from. These are Webster Chicago adapters. I know what you’re thinking…the Webster adapters are metal. You’re right, except this is another version that Webster released. I honestly can’t tell you what these are made of. To me they almost feel like a heavy cardboard or something, but definitely not metal so I put them on this page. The more modern adapters that have a similar material use what’s called MDF (medium-density fibreboard). It’s basically an engineered wood product and is stronger and more denser than particle board. This appears to be a similar material. I would assume that this “may” have been Websters attempt to come up with a cheaper alternative to the metal adapters which were quite costly to produce. I would think that these were rather early adapters since there were no drive pins on them. I have two versions here. One says Webster Chicago Corp and is a bit more brown while the other has no markings and is solid black. So here is yet another style that for several years I really have little information to go on. This adapter is somewhat similar to a Recoton adapter, although this one is much more rounded. As you can see, the first adapter below has no branding on it so I had no way to really identify it. I’ve now come across a “slightly” different one, but similar enough to make a possible connection. As you can see, the second adapter is labeled Columbia and looks very much like the first one. The Columbia Phonograph Company was founded in 1887 by Edward D. Easton. By 1951, Columbia US began issuing records in the 45 rpm format. Based on that, I’m assuming that these adapters were from sometime in the 50’s or 60’s. This is a Polydor record adapter. Polydor was originally an independent branch of Deutsche Grammophon Gesellschaft which was founded in 1898 by German-born United States citizen Emile Berliner. If you happened to read the History page on this site, you’ll recognize Emile Berliner as being the creator of the first known lateral cut record in 1889. He also created the Gramophone. Polydor had become known for it’s “popular music” label in 1946 under the His Masters Voice trademark. It was sometime after that, probably in late the 50’s that this adapter was developed. I like this adapter because of its uniqueness. It actually has two parts, a front and a back. The two pieces twist onto each other and lock together which connects the two sides as one. If you look closely at the adapter, you can see how the two pieces connect. These adapters were extremely lightweight and many of these that I see today have one side normally broken. These are Raydor adapters. Having the name, I kinda figured that I would be able to come up with something on this company. Unfortunately, I’ve found nothing. I can only assume that this is from the late 50’s early 60’s since it has drive pins. I’m going to place this next adapter under the Vintage section, although I’m basing that only on the fact that this adapter “feels” old. It’s worn in places that you would expect to see wear. This adapter is stamped Discoteca on the front, which means Record Store in Portugues. It took me about a half an hour and a strong magnifying glass to make out the writing on the back. The back reads Av. Antonio Augusto de Aguiar Lisboa and is an avenue and street address in Lisboa. This adapter is unique in that it has slots cut around both sides of the adapter. This almost appears to have been an attempt for the adapter to somehow lock into another adapter. These would have taken the place of the drive pins. It may actually work since the grooves stick out slightly from the adapter which would probably allow two similar adapters to lock. I’ve only seen this adapter in yellow. This next adapter is one that I’m not really sure if it’s vintage or not, but it “may” be. I was told by one person that this type of adapter was used in 45 jukeboxes. I have not confirmed this, but at least for now I’ll leave it in the vintage section. I’m thinking that it’s not jukebox related since it had drive pins. Since jukeboxes only play records one at a time, I don’t see where there would have been a need for them. Ok, so I’m preparing you, this will be a HUGE category. These will be all the Duotone style adapters. There are so many slight variations to this adapter, and I’ll do my best to document most of them here. Some of this may appear redundant, but each group will have slight differences. This first adapter is an actual Duotone adapter. This is the one that all the others are modeled after. I believe that Duotone made many of these variations as they sold their adapters to other companies who then turned around and put their name on them. These next two adapters are Snap-It plastic adapters. Snap-It was probably more well known for their metal adapters. As you can see, the corners of this adapter are much more rounded than that of the original Duotone adapter. This variation of the Duotone adapter, the words 45 R.P.M. Adatper appears on one side. There are no markings on the other side. Although this clearly appears to be a vintage adapter, I have not been able to come up with any information on this. The research continues…. and as you can see from the Discogs page, they indeed were from Trieste, Italy. That Motown adapter was included in a limited edition of 7″ records to celebrate the 50th Label Anniversary in 2009, which is when the 7″ you got with the adapter was released. Hi Zoli. Thanks for the update. I went ahead and moved the Motown adapter to the Modern page and corrected it to 50th instead of 25th. Always good to see some new adapters here. I’ve had no luck finding anything new lately. I do however have one exactly like your Cerri Dischi Cerri one, except mine is black. I found that Cerri is a somewhat common last name in Italy in fact there’s a famous Jazz guitarist named Franco Cerri. There is also a town named Cerri that is not all that far from Viareggio (about a half hour drive). My thought was that Cerri Dischi Cerri might be the name of a record store or maybe there are locations in both cities although I think there would be another dash in that case. forgot to mention I have seen a picture of an Italian dartboard adapter with IL DISCO printed on it three times around the circle. The caption on the picture mentioned that IL DISCO was a record store which is what makes me think this one is probably one too. Have som info on the yellow Portugues disc. The front marking “DISCOTECA” means RECORD STORe in Portugues. The back marking “Av. Antonio Augusto de Aguiar.3A Lisboa” is not a region. It is an avenue and street adress in Lisboa. Been thinking on how adapters are marked. In my collection only four (4) types are marked with the word “ADAPTER” (Philco, Mercury, Tone-King and 45rprecordadapters.com). All others with such marking has the word “ADAPTOR” on them. Most of the DUOTONE types that have such marking has “ADAPTOR” on them. Thus you have the wrong marking in your comments to the “Automatic Plastics Company” one and the last DUOTONE type. So, my main reflection is why we call these things ADAPTERS? Would it be more correct to call them ADAPTORS, since that is a more common marking? Now have that dart board adapter in beige. And again from Italy // Zoli. Hi Zoli. Yep, leave it to you to come up with some color variation that I’ve never seen before. Nice find! I’ve never even seen that color in pictures. I now have that dart board adapter in white, so you can update that info. Hi Zoli. I also got my hands on a white one. I’ll get that posted to the site shortly. If you keep getting them from Italy, we’re going to have to assume (until we’re proven wrong) that they’re Italian. Thanks for the update. I really appreciate it. I’m very disappointed to say that Guinness World Records will not consider “Largest collection of different 45 record/turntable adapters” to be a worthy catagory for there book/ website. I’ve been waiting for a reply since Febuary and just got it today. But that’s ok, I don’t need a world record to enjoy collecting adapters. And to be honest my collection probably isn’t the largest anyway. That’s awesome! LOL Great effort on your part. Would have loved to see that. I give you credit for giving it a shot! Hey Zoli. Well that confirms it then. I’ll go ahead and update my comments to reflect that. I read a post you (Bob) made on another page, and one of the replys to that post was from a nonbeliever in these little plastic and metal pieces of nostalgia. I’m glad you started taking photographs of your collection and I hope I can somehow contribute to the building of information on this site. Your already light years ahead of me but I’m learning. In other words thanks for taking the time to make this website. Hi Brian. I’m really glad to hear that you’re enjoying this! I’ve done hours of research trying to come up with something that at least makes a little sense! Hope this is a good start. I’ve got a lot more adapters to photograph, mask and post yet, so bear with me. Trying to find the time is sometimes difficult. If you ever have additional information for me here, please let me know. I’m more than glad to update the site as necessary. Your website is very informative. I have just started collecting 45 adapters and have cleaned out everywhere I can think of in the central Ohio area. If you would be willing to sell some of your extras please contact me. Thank you. Hi Brian. Yes, I have some duplicates that are available for sale. Give me a couple days to photograph them and I’ll put them up on my Items for Sale page. If you’re interested in any of the ones I put up, just let me know. If we agree on any of them, I’ll just send you a PayPal invoice. They will have to be a first come first serve since I don’t have a shopping cart set up on this site. Hey, how are you doing? I just got one of those doggy bone ones in the mail today from Italy and saw you had added one. Mine is marked VAAM around the center on one side. From what little I’ve been able to gather, VAAM is Vannes Ambrosi, a manufacturer in Milan that made radios early on. Thanks for the info Gil! I was really at a loss with this one so this might at least have us going in the right direction. I’ll go ahead and add this information to the page. Great find!